Interjections are words that show excitement or emotion. Nouns of direct address name the person or people being spoken to. Neither of these are grammatically related to the rest of the sentence. This means that they don't describe, modify, or affect anything else in the sentence. 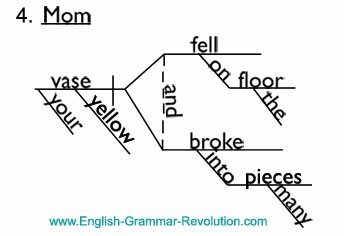 You'll learn how to diagram these bad boys with the following fun sentence diagramming exercises. The answers are at the bottom of the page. Don't peek until you've tried them! 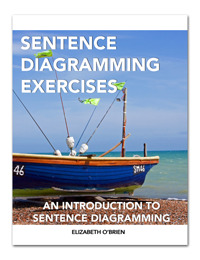 * Get your hands on the 120-page Sentence Diagramming Exercises book. It includes all of these instructions, exercises, and answer keys. Yeah, it's pretty cool. Psst! You can also see a list of interjections if you'd like. Do you remember reading that these are not grammatically related to the rest of the sentence? I hope so. It was only a few short paragraphs ago! Anyway, it's really easy to SEE this when we diagram them. 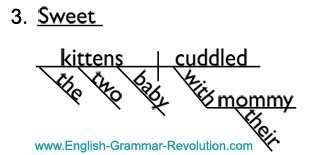 Put interjections and nouns of direct address on lines that hang above the rest of the sentence. Here are some examples. Notice that you can SEE how they aren't grammatically related to the other words. Directions: Use what you've learned in the last five chapters to diagram the following sentences. 1. 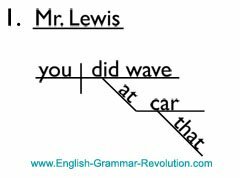 Mr. Lewis, did you wave at that car? 2. 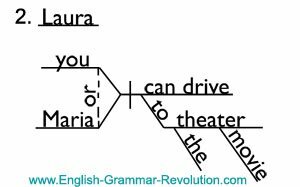 Laura, can you or Maria drive to the movie theater? 3. Sweet, the two baby kittens cuddled with their mommy. 4. Mom, your yellow vase fell on the floor and broke into many pieces. 5. Yikes! Our car just stopped on the highway in the middle of the road. Now that my first year of teaching eighth grade English and honors is nearing an end, I just want to say that your sentence diagramming book was a phenomenal success in my classroom. I had always been reluctant to teach diagramming because I thought that the students would find it mundane; however, the opposite proved to be true. Every year, my colleagues and I would complain that no matter what approach we took to teaching the parts of speech, students were not retaining them. 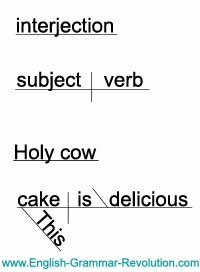 To my surprise, both my honors students and my general education students learned the parts of speech, improved their sentence structure and, most importantly, loved diagramming. Who would have thought? I rave about your program to my colleagues because my students had so much success with it. Thank you so much! Finished Chapter 5? Move on to Chapter 6.